In his first NHL draft as the general manager of the Minnesota Wild, Paul Fenton stayed put at No. 24 overall and selected Filip Johansson, a defenseman from Sweden. Johansson is a right-handed defenseman who was the 10th-ranked European skater by NHL Central Scouting and the 55th-best prospect overall by hockeyprospect.com. Johansson, who stands 6-foot and weighs 176 pounds, won a bronze medal this winter with Sweden’s U-18 team at World Juniors and a gold medal in 2016-17 on the U-17 squad. 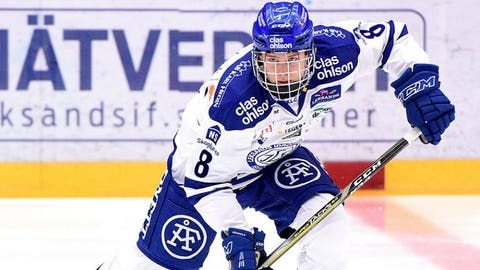 The 18-year-old spent most of last season with Leksands’ junior team and tallied four goals and five assists in 29 games with Leksands IF J20. Minnesota has seven picks remaining in the final six rounds of the NHL draft, which resumes Saturday. Three of those draft picks are in the third round (No. 63, No. 86, No. 92), two in the fifth (No. 148, No. 155) and one each in the sixth (No. 179) and seventh (No. 210).